We held our party on Saturday evening after the girls' piano recital. We offered them a special dinner of their own choosing, but they asked for this... and a trip to the coffee shop! This week was almost exactly like last year (without the pulled muscle). The straw was the lightning. It was supposed to be yellow but looked more greenish. We made our own kite brownies. I hate frosting brownies because they are so flaky on top but it was definitely more fun than buying the prepackaged ones. We were going to embellish them further, but ran out of time before the recital. I love it! 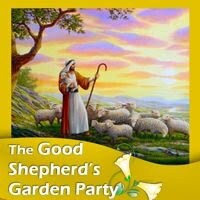 I have to do this Shepherd's Garden party thing one of these years. I love the pizza sun. My kids would flip. We're doing it for the first time this year and it's been a lot of fun. The kids sure like it! So cute Charlotte. The kids must love helping prepare it and then consuming it!